If you’re new to meal prepping, or just picking up cooking, you’ll want to get the basics equipment in your kitchen. The point of this guide is to break down all of the items that make meal prepping more effective. Your time is valuable. Investing in some basic kitchen gear will make reaching your health and fitness goals that much easier. Let’s dive in! With that in mind, select an option that suits your lifestyle and needs. Make sure that it’s dishwasher safe to save time cleaning! The Fitpacker Meal Prep Containers are an economical offering that gets the job done. They have robust, BPA-free plastic that is dishwasher safe. If you currently don’t have any meal prepping containers and don’t want to pay for glass, this will be your ideal option. 16 containers is also plenty! The Royal Glass Storage Containers set contains a total of 10 glass containers of varying sizes. The different sizes are useful for storing different quantities and types of food. Smaller containers are useful for nuts, hardboiled eggs, and snacks. Large containers can easily store ground meats, saucy dishes, and stews. Glass is easily stored and will not taint your food. The two compartment glass storage container set is useful for transporting two foods that don’t mix well together, such as breads and liquids, bbq chicken and broccoli, etc. Weight loss- A big benefit to multiple compartments is portion control. If you’re struggling with overeating, you’ll be able to easily portion out foods to keep you on track. If you need a high degree of portion control for weight loss, fat loss, etc, these containers will be your best bet. That said, they have the highest price per unit. If you frequently spend a long time away from the kitchen, consider this option. The insulated bag will keep your food cold for several hours, allow you to maintain your diet for 3-4 meals in a row in a single day. If you travel for several days in a row and sleep at hotels, this is probably your best investment. Take this bag with you for lunch and dinner, and refrigerate the food overnight. You’ll be glad you did. Eating out 3 or 4 times a day is expensive and can get quite unhealthy. The AmazonBasics baking sheets are the perfect starter kit if you don’t currently own any baking sheets. The various sizes are perfect for roasting vegetables, chicken breasts, meatballs, etc. Having multiple baking sheets alleviates the need to immediately clean a sheet if you’re having a big day in the kitchen. That said, the largest sheet in this set is 11.5×17 inches- This is acceptable, but baking sheets can get much larger and result in more food prepped at once. The Wilton 15″ x 21″ Aluminum 3/4 Baking Sheet is your workhorse. Three-quarter sheets are amazing for preparing MASSIVE batches of food such as 8-10 chicken breasts, or a huge vegetable medley. Having one massive baking sheet is worthwhile. You’ll be able to prep an extra full day of food, and reduce your weekly cooking to a minimum. The surface is nonstick and easily cleaned. Rice cookers are essential in effectively making rice, quinoa, and other simple carbohydrate sources. Rice cookers are completely hands-off. You add the rice, add the water, turn it on, and it will automatically shut off when the rice is complete. If you have cooked rice in a pan before, you’ll know that it’s almost too easy to overcook or burn rice. Not to mention, you need to tend the stove and keep an eye on the process. In all honesty, this guy does the trick. Simple load the rice, quinoa, or vegetables, add water to the desired level, turn it on, and you’re done. The black bowl is removable and can be easily stored in the fridge. You won’t need to dirty multiple bowls or clean anything extra. You can expect this product to work a good 2-3 years under heavy use before it gets too worn out. But for the price point of around $15, it’s the perfect deal for someone that hasn’t cooked rice like this before. This product has improved technology and interface, which gives you greater control over what you’re cooking- custom cook duration, delay features, and different settings for various rices and vegetables. You won’t need to buy anything fancier than this. Much like the rice cooker, you’ll be preparing a large batch of food without really doing much. Simply add your ingredients, turn it on, and collect the finished meal a few hours later. 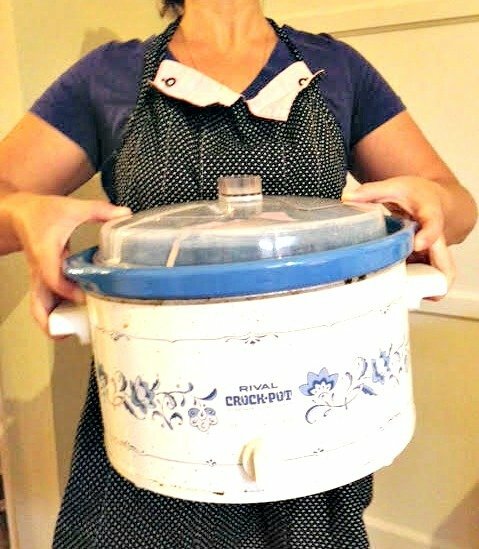 There are several options for crock pots. Let’s break them down. This thing survived World War 2. It’s stained, it’s tattered, but damnit, it works. Before leaving for college she’ll say “Do you want the crock pot in the basement?”, to which you’ll reluctantly say “yes”. But once you realize you can add chicken and some leftover Natural Light to make food for the week, you’ll fall in love. You’ll want a programmable slow cooker with high and low features. Depending on how much time you have, you can slow down or speed up making any meal. This Crock Pot contains both of those features and has a very simple user interface- You won’t need the manual to program it. Additionally, it has a “keep warm” setting which is excellent for serving or combining and blending ingredients after the majority of the cooking is complete. Out of any slow cooker available, this is the best option for functionality and price. From preparing cubed meats, to making sauces, and flavorful garnishes- skillets are an absolute must-have item for your kitchen. The T-Fal 3 piece skillet set is the perfect entry level skillet set. It includes an 8″, 9.5″, and 11″ skillets. All pans are nonstick and easily cleaned. The sizes in this set are perfect for eggs/omelettes, sauteing vegetables, and preparing a variety of meats. The Calphalon pans are incredibly high quality. These products have a very solid weight, which the cheaper alternatives do not have. The handle is fastened securely to the pan with three very tight bolts and will not come loose. You’ll feel in control of the food the entire time. The non-stick coating is top-tier and is easily cleaned. DO NOT use metal utensils on these pans! Keep it scratch free to extend the life. If you are experienced with skillets, or have the budget for it, get the Calphalon pans. This knife block set is the perfect set for new chefs and veterans alike. It’s reasonably priced and you’ll be able to do anything in your kitchen. If you’re living alone or with another 1-2 roommates, this set will have the perfect amount of knives to rotate. The AmazonBasics knife set would be the next step up from the first Cuisinart set. The big upgrades here are the extra 6-inch boning and pairing knife, and a total of 8 steak knives. This set is ideal for a more serious individual chef, a household with 3-4 people, or a household with two chefs. While we’re cutting, let’s get a board. We’ll recommend three options. All boards work, this is just personal preference and budget. You will want at least two boards. Many recipes involve meat and vegetables. You’ll want to keep these on separate boards to prevent spreading salmonella and other bacteria. Bamboo cutting boards will increase the life of your knives. They’re slightly more appealing for serving, but also require more care- They need to be hand washed. If you don’t mind the additional cleaning and have an eye for aesthetics, this may be your ideal option. Bottom line: it’ll do. Considering getting two.